Defend yourself with knowledge, awareness, and detection. Book the real Danny Lents to speak to your group about identity theft. What Is In Your Wallet or Purse? Do You Make These 6 ID Theft Mistakes? Almost 10 million Americans become victims of identity theft each year. I became a victim in 2001. I've researched identity theft extensively to protect myself and help others. I want to help you avoid this nightmare. Your odds of becoming a victim are greatly reduced with knowledge, awareness, and detection. Take action now to avoid becoming the next identity theft victim. Please visit the Victim Action List if you are an identity theft victim. Identity theft is in the news. There are massive marketing campaigns to sell identity theft insurance. You probably know someone who has been an identity theft victim. It seems you're almost helpless to avoid this crime. You are not! There is a lot you can do to avoid becoming an identity theft victim. My identity thief spent $16,000 in 30 days. I've spent years researching identity theft and raising awareness so others can increase their odds of avoiding it. I'm a software engineer by profession. I develop custom software at Blue Canyon Software. I'm always interested in ideas of using software solutions to fight identity theft. Please email your ideas of fighting identity theft. Contact me, the real Danny Lents, if you need an ID theft speaker for your group. I want to raise your awareness about identity theft and decrease the odds that you will be the next victim. I've heard testimonies from so many people about their identity theft experiences through my speaking engagements and emails to IdTheftAwareness.com. Some identity theft victims experience endless battles with devastating consequences that are not limited to credit fraud. Contact me to speak to your group about identity theft. I will motivate them to take proactive steps to protect themselves, your customers, and your business from identity theft. Financial fraud is a common type of identity theft but ID thieves use stolen identities in other ways as well. Some thieves use your identity to get jobs. In 2013, the FTC reported that 30% of ID theft complaints were about tax or wage-related fraud. Thieves can use your identity to access medical treatment resulting in bills and false health information in your medical records. You didn't know you had your appendix removed??? A false criminal record is possible too. Your identity thief can get arrested as you and get released on bail. Will your thief show up for your court date? You'll protest your innocence all the way to jail. Will your employer believe you are a victim of identity theft? There is no silver bullet to kill identity theft. Gaining fraudulent advantage using another's identity has been going on since Jacob stole his brother's identity a long time ago as noted in the Bible Genesis chapter 27. The battle against identity theft is waged on several fronts to include effective legislation and prosecution, data protection practices by businesses and individuals and better identification documents just to name a few. 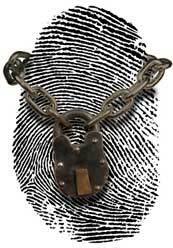 The best deterrent to identity theft and most crimes is to raise awareness and educate businesses and individuals. What methods do ID thieves use to steal your information? What roadblocks can you place in the path of your ID thief? How should you react if your identity is stolen? What red flags should employees look for when a thief is trying to steal identity information about their customers?